Bangkorai Pass is a mountain pass on the border between High Rock and Hammerfell, in the Bangkorai region (which was named after the pass). 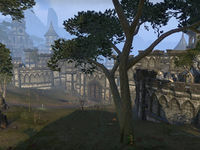 The pass is home to the Bangkorai Garrison, which has played a crucial role in defending High Rock against invaders from Hammerfell and the eastern lands for centuries. Many great battles took place at Bangkorai Pass throughout its history. In 1E 874, Warlord Thulgeg's army of Orcs and goblins, driven from Hammerfell by the Redguards, was stopped at the pass and forced to flee northeast. In 1E 973, King Joile of Daggerfall betrayed his Redguard allies and attempted to invade Hammerfell. A group of Ansei defended the pass against his army, but eventually all of them fell, except Makela Leki. In desperation, Leki was able to summon her spirit sword, which allowed her to single-handedly defeat the Breton army and slay King Joile. However, she died of her wounds shortly afterwards. Before her death, she was able to record her memories in a magical memory stone, which was later recovered. In 1E 1029, Empress Hestra deposed King Styriche, the Vampire of Verkarth. Styriche fled west, destroying everything in his path, until he was defeated at the Bangkorai Pass. Pelin, a priest of Stendarr who would later be known as Saint Pelin, died during that battle. Empress Hestra was so impressed by the bravery of the Bretons that she decided to add High Rock to the Alessian Empire. In 1E 2305, after High Rock seceded from the Empire, the Alessian Horde invaded the province to reclaim it by force. The Alessian army under Abbot-General Priscus Mactator was also defeated at the Bangkorai Pass. However, the Bangkorai Garrison could not protect High Rock against Durcorach the Black Drake in 2E 541. His army poured into Mournoth and Ephesus from the eastern mountains, sacked Evermore and took the garrison from behind. In 2E 582, High Rock was threatened again, this time by the Seventh Legion under the command of Septima Tharn. The Imperial forces even managed to capture the garrison itself and open a Dark Anchor to Coldharbour for Daedric reinforcements, but were ultimately defeated by the forces of the Daggerfall Covenant, including the Soulless One, High King Emeric, and Queen Arzhela of Evermore.